Former governor of Alaska Sarah Palin appeared on Fox News on Tuesday mocking Katie Couric over quitting her position as CBS News anchor after five years. Couric had told People Magazine that she was looking forward to her new position that would allow her to work on "multi-dimensional storytelling". Palin said "Yeah, and I hear that she wants to now engage in more 'multi-dimensional story telling' versus I guess just the 'straight on, read into the, that teleprompter screen story telling...More power to her. I wish her well in her - 'multi-dimensional story telling.'" 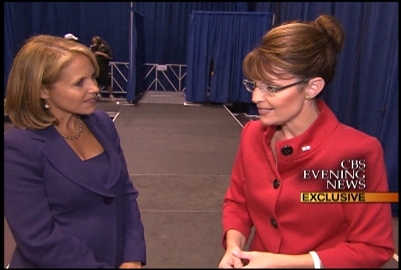 Since Couric's most memorable interview with Palin during the 2008 presidential campaign (see video below). The most memorable moment was when Couric asked "When it comes to establishing your world view?what newspapers and magazines did you regularly read?" Palin was unable to name on publication. Later she said she found the question insulting and emblematic of a liberal slant in the mainstream media.